In this final installment of this series in working with Content Center, I am covering the Content Center editor interface and also start to walk you through the creation (copying) of a family table and how it gets populated. As indicated in Part 2 of this series, this interface may look like Windows Explorer but it doesn’t function that way. If you create a category and/or family table and realize you made a mistake in its location, it cannot be moved or copied to a new location (category). Ask yourself when you are editing, do you really need to see all the current libraries that are associated to your Content Center. If you do not work with certain standards, update your project file and only load the libraries that you actually need. In doing so, it makes the interface much easier to work with. In fact, the fewer libraries you load into memory, the faster content center will respond. IMPORTANT TO KNOW: When someone accesses the interface and edits a given family table, there is no “lock-down” of the associated library. Meaning other editors can still access the interface and start performing edits on the same family table or another table within the library. If this occurs, the last person to exit will only have their changes applied. It is important to communicate to your team while you perform edits on your custom libraries. When working with the Vault version of Content Center, beware of idle times exceeding 30 minutes when editing a family table. If you are going to be away for a while, make sure to exit the editing session of the family table. Note: When there is no communication to Vault for at least 30 minutes, the Vault server automatically releases your license and your connection to the family table may be lost. When working with a large amount of family table data (populating it), make sure to select the “Apply” or “OKAY” button every so often while in the family table to ensure you entries are being published back to the library. Waiting to the end just runs the risk of something happening and you are unable to publish it when you want to. Years ago I learned this the hard way and I lost enormous amount of data because I fail to stop every so often and do this. Let’s now access the Content Center editor and start using this interface. Whether you are using the desktop version of Content Center or Vault, the information I am providing is still the same. But remember when using Vault content, your account must have at least the Content Center Editor, Content Center Admin or Vault Admin role assigned to it. 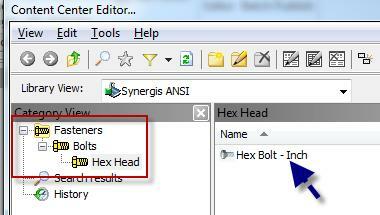 When there is no file loaded into Inventor, the editor is accessed by the Tools ribbon tab. When a file is loaded into memory the editor appears under the Manage Ribbon tab. Depending on your library view, you may notice certain Content Center categories and family table icons appear “grayed out”. This is an indication these categories or family tables belong to a read only content center library and thus it cannot be changed. 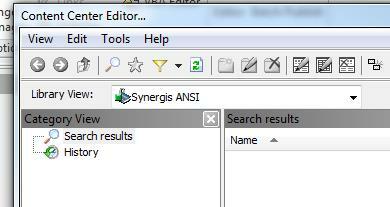 If I change my library view over to my custom library (Synergis ANSI), the view is blank since there is no information currently in my library. Though it’s very straight forward to create your own categories in your custom library, the one thing I want to cover is the steps you take when you want to duplicate an existing structure. In recreating an existing category structure, the structure must be copied instead of manually creating it. 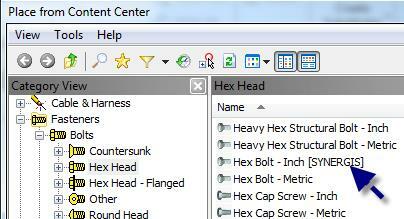 As an example, my company has a special hex bolt that we use in our designs. However, I want to place this bolt in the same existing structure as the other fasteners are. But since this structure is gray, I am unable to add to it because it belongs to one of the provided read only libraries. 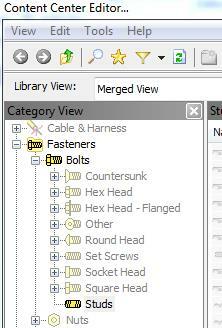 So I decided to recreate the category structure (Fasteners/Bolts) in my library hoping it will all merge together. When I toggle my library view back to the merged view, guess what happens? 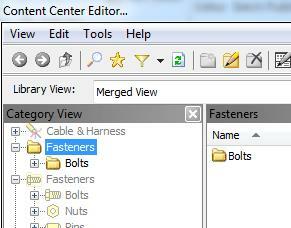 There are two fastener categories now and I’m a little upset by what I am seeing. So let’s back up and do this properly. First toggle your library view back over to the merged view and navigate to the category you want to recreate. In my case, I just want to copy the structure Fasteners/Bolts over into my library. 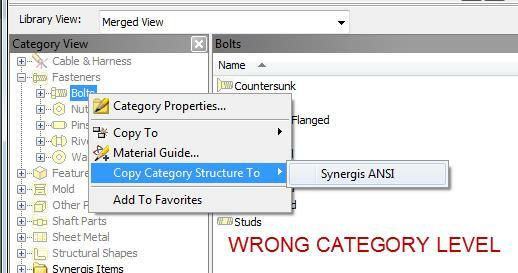 However, since there are numerous sub-categories under Bolts, I actually need to copy the structure at the next lowest sub-category. Why is that you ask? When the copy structure is selected for a given category, the entire structure underneath it will also be included. 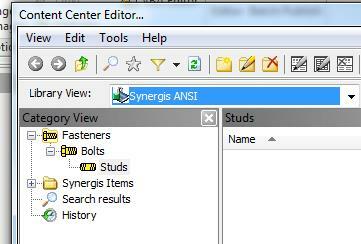 For my example, I am going to choose the category “STUDS” since it does not have any other categories below it. I will then right mouse click and select “Copy Category Structure to” your custom library. Granted, I now have a category I may never use, but it’s a lot easier to delete one category compared to many of them. 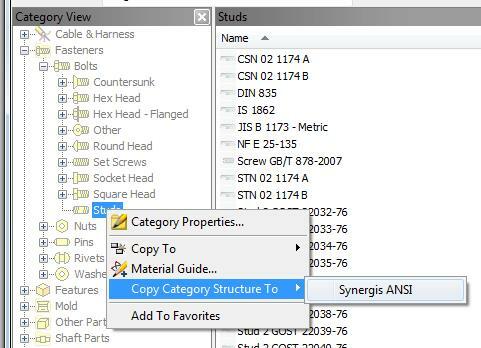 Now in the merged library view you will notice the category of Fasteners/Bolts/Studs appears only once and in my custom library the structure appears exactly the same. I said building your own categories is easy, however, if you copy the family table instead, the structure comes along for the ride. For example, my company is using those ANSI standard hex (head) bolts in our designs, and currently, this information only resides in a read only category and I am unable to modify it to meet our needs. So instead of copying the structure first, I am going to toggle my library view back over to the “merged” view and navigate to the family table associated to ANSI hex bolts. Next, I will right mouse click on that family table and select “Copy to” my custom library. Now if I toggle back over to viewing only my custom library, you will notice not only did it copy the family, it also brought over the associated category as well. Hooray, less work for me! When a family table is copied per this method, it is linked back to the table it was copied from. When viewing the family table as a thumbnail in the main pane, you will notice the icon has a link symbol associated to it. Though I am not going into the details of what a linked family is, I would like to pass along how I separate it from the one it was copied from. To do this (while still viewing my custom library), I simply change its family table name, by right mouse clicking on it and select “Family Properties”. Under the General tab/Family Name field, I like to add my company name enclosed in brackets and typed using uppercase lettering to state “this library was modified for my company”. Though it’s an optional step, it informs the end users this content center information has been modified to meet your requirements. In addition, it also makes it easier to find especially when I am looking at all of the information under the merged view or trying to select the family table while in an assembly. I also like to point out there is another family table copying method called “Save Copy As” which allows the user to create a new family table that is not linked back to the parent it was copied from. If you want additional information about this please refer to the Inventor Help file. Yellow: When a cell, row etc. highlights in yellow, it is an indication this information has been added/changed and has not been published back to library. Basically they are unsaved changes. Also under this condition, a lightning bolt will appear at the row header indicating something has changed within this row. Blue: If a cell value is blue, it indicates the value is under the control of the column expression. In most cases, the entire column cells will appear in blue, however, if one or more looks normal (black), it just indicates someone over-wrote the value of the expression and manually entered the information. An expression is just a simple way of combining the information from other family table columns into a value for the column you are working on. Or it’s a fast way of populating large amount of data in that column (which I will demonstrate later on in this article). 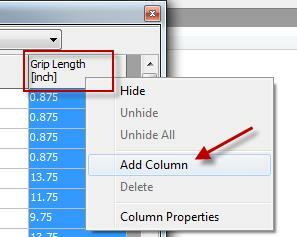 Red: If a column header is red, it indicates this column is considered a key column. A key column is associated to the values (questions) that are asked when a user places the content center component in his/her assembly. When I am setting up a family table for my requirements, the first thing I am going to do is create all of my necessary columns and then start populating my required information. Although you do not need to do this, I like to start at the last column in the family table and add information from that point on. Columns can be added to your family table any way and the order does not matter. 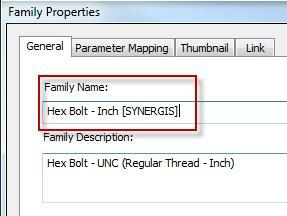 To add a column, simply right mouse click on an existing column header in the family table and select “Add Column”. Next, define the column name and caption. For the column name, it cannot already exist in the family table and must never have spaces in it. The column caption on the other hand can contain spaces and already exist in the family table. I recommend keeping both of these names the same for ease of use. 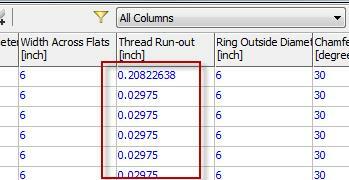 The “Data Type” will be left as a string and no units will be defined when working with a copied family table. However, when you get into creating your own custom libraries from scratch you may have to adjust the data type and unit field per your requirements. 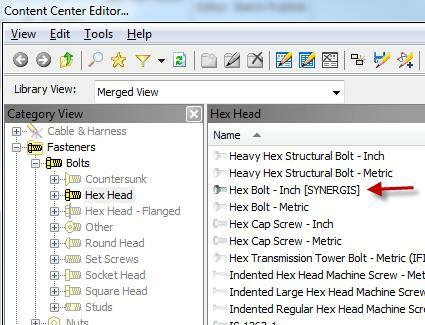 For my example, I am going to create a column that will represent the reference number in my Enterprise Resource Planning (ERP) application for these ANSI hex bolts. At this time, I am not going to populate the column cells with my ERP system information because I am not ready to do so. Remember, create all of the columns first and then populate the information. At the same time, I want the end users to know if they pick a size that is not in our ERP system, three dashes “—“would appear instead. To do this, I am going to create an expression by turning the feature on and enter it as the three dashes. 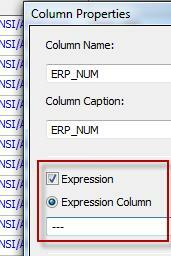 I am using the expression field at this time to populate the entire column as three dashes in one quick easy step. 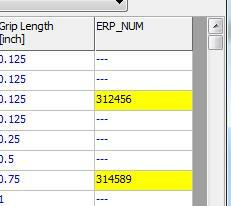 The next step is to link this column to a custom iProperty in my Inventor part so the ERP reference number will appear in my BOMs. To do this I am going to select the pull-down list of “Map To Inventor Property” field and select Custom. Next, type in the custom (Inventor) iProperty that will be created when this part is retrieved from Content Center and placed into an assembly. As you can see from my example, my column header, caption and custom property names are all the same. I like to keep all my information alike which makes it easier to follow and manage later on when there is an issue. I recommend for you to follow the same practice. Once I select the OK button, my new column appears in the family table. In addition, when I do start populating my information, I am able to override a driven expression cell and manually enter my related ERP reference number for that given ANSI hex bolt. 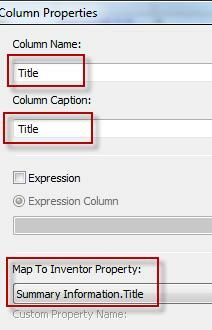 Certain standard Inventor iProperties such as Title, Subject, Description, etc. do not exist in any of the provided family tables. Meaning if you require this information to reside in your parts, you must add them to your family table and associate it to the related Inventor property. The “file name” column is another important column not to overlook. It is very important to have a good understanding of this column and make sure you are creating unique file names for the Content Center members you are generating. 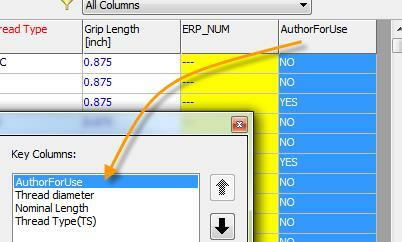 Use the expression feature to populate your column with data from other columns. This is a powerful tool and it saves a great deal of time. 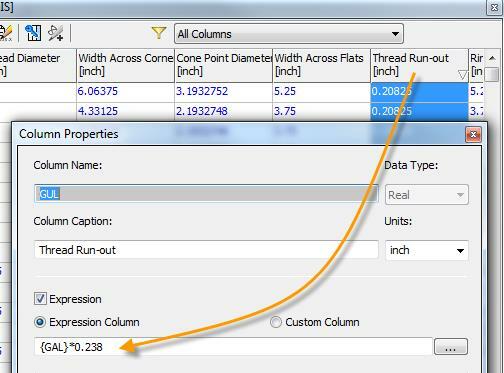 A lot of times the column information you add will be mapped back to the Inventor iProperties, however, you can create columns just for reference information and not map it. For example, I have always been a stickler for knowing who made the entries in a given family table and when was it done. Meaning, I would create two additional columns in my family table, where one is associated to the name of the person who entered the info and the other column refers to the date when it was done. Even though a copy family table may already have the key columns defined; use this feature to your advantage. However, beware of the amount of data that is being represented on the screen and do not exceed 7 key column definitions. I am also a firm believer of leaving existing data alone and creating a copy of it for editing. I have seen instances where the original information was changed and something happened to the copied table where-as the original data could no longer be restored. 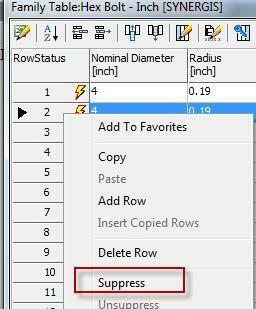 If you do not want certain family table members to appear or certain sizes are not being used… Don’t delete the rows! Instead use the suppress row option or create a YES/NO (first) key column that sorts the information for you based on how the user responded to the questions while placing the component in their assembly. Once all the required columns are defined, the next step is to populate the columns per your information and define more members as needed. Whenever you add members to your family table, whether it’s now or later, I recommend that you first right mouse click on a given member row, then select Insert Copied Row, and repeat the process again. This way any of the original information is still intact and accessible later on. As a reminder, when editing your family table and entering your information, periodically select the APPLY or OK button to publish your information back to the library. Do not wait until the end. I hope I have shed some light on how Inventor Content Center works throughout this three part article. Like I said earlier, I could spend a significant amount of time going into every little detail of this interface, but for brevity I focused on what I thought was important in getting you started. Though there is not currently open-enrollment training for just Inventor Content Center, Synergis Engineering Design Solutions regularly sits down with customers to develop an implementation and training plan that is tailored to meet your Content Center needs. 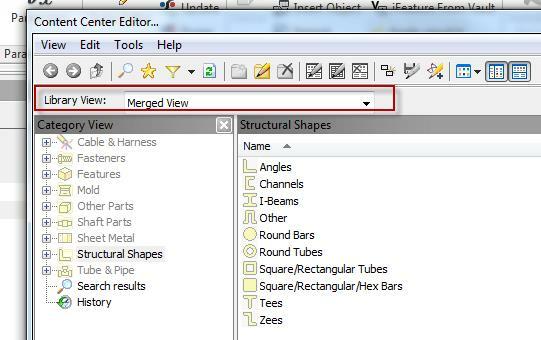 Have a great time exploring and expanding your Inventor Content Center structure. Mark Lancaster is the newest member to our Synergis technical team, having just joined us back in August. His most previous experience is as the CAD Design Manager of Pall Corporation, one of our long time customers. In that position, he was responsible for workstation optimization and design management, established uniform standards for the local and global offices, and developed global systems to control and manage their design data.